The 2005 act that authorized the redesign for the Bicentennial stated that another redesigned reverse for the Lincoln cent will be minted which "shall bear an image emblematic of President Lincoln's preservation of the United States of America as a single and united country". Eighteen designs were proposed for the reverse of the 2010 cent. On April 16, 2009 the Commission of Fine Arts (CFA) met and selected a design that showed 13 wheat sheaves bound together with a ring symbolizing American unity as one nation. Later this design was withdrawn because it was similar to coinage issued in Germany in the 1920s. The Citizens Coinage Advisory Committee later met and chose a design showing a Union shield with ONE CENT superimposed in a scroll; E Pluribus Unum was also depicted in the upper portion of the shield. In June 2009 the CFA met again and chose a design featuring a modern rendition of the American flag. As a part of the release ceremony for the last of the 2009 cents on November 12, the design for the 2010 cent was announced. The design chosen was the one that was chosen earlier by the CCAC. According to the Mint, the 13 stripes on the shield "represent the states joined in one compact union to support the Federal government, represented by the horizontal bar above." The Mint also noted that a shield was commonly used in paintings in the Capitol hallways painted by Constantino Brumidi, an artist in the Capitol active during the Lincoln Presidency. The obverse of the cent was also changed to a modern rendition of Brenner's design. The new Union Shield design replaces the Lincoln memorial in use since 1959. The coin was designed by artist Lyndall Bass and sculpted by US Mint sculptor-engraver Joseph Menna. In January 2010, the coins were released early in Puerto Rico; this was caused by a shortage of 2009-dated pennies on the island. The new design was released at a ceremony at the Abraham Lincoln Presidential Library in Springfield, Illinois on February 11, 2010. The United States one-cent coin, commonly known as a penny, is a unit of currency equaling one one-hundredth of a United States dollar. The cent's symbol is ¢. Its obverse has featured the profile of President Abraham Lincoln since 1909, the centennial of his birth. From 1959 (the sesquicentennial of Lincoln's birth) to 2008, the reverse featured the Lincoln Memorial. Four different reverse designs in 2009 honored Lincoln's 200th birthday and a new, permanent reverse – the Union Shield – was introduced in 2010. The coin is 0.75 inches (19.05 mm) in diameter and 0.061 inches (1.55 mm) in thickness. As of 2013, based on the US Mint Annual Report released in 2014, it costs the U.S. Mint 1.83 cents (down from 2.41 cents in 2011) to make one cent because of the cost of materials, production, and distribution. This figure includes the Mint’s fixed components for distribution and fabrication, as well as Mint overhead allocated to the penny. Fixed costs and overhead would have to be absorbed by other circulating coins without the penny. The loss in profitability due to producing the one cent coin in the United States for the year of 2013 was $55,000,000. This was a slight decrease from 2012, the year before, which had a production loss of $58,000,000. The Lincoln cent is the current one cent coin of the U.S. dollar. It was adopted in 1909, replacing the Indian Head cent. Its reverse was changed in 1959 from a wheat stalks design to a design which includes the Lincoln Memorial (to commemorate Lincoln's sesquicentennial) and was replaced again in 2009 with four new designs to commemorate Lincoln's bicentennial. There are more one-cent coins produced than any other denomination, which makes the Lincoln cent a familiar item. In its lifespan, this coin has weathered both world wars, one of which temporarily changed its composition as part of the war effort. The obverse is the longest design used for any circulating American currency. 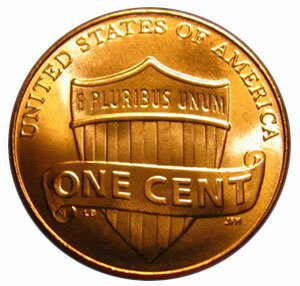 It has been suggested that the cent should be eliminated as a unit of currency for several reasons including that many Americans do not actually spend them, but rather only receive them in change at stores and proceed to return them to a bank for higher denomination currencies, or cash them in at coin counting kiosks. Most modern vending machines do not accept pennies, further diminishing their utility, and the production cost (figured in U.S. Dollars) now exceeds the face value of the coin, caused by increasing inflation. In 2001 and 2006, for example, United States Representative Jim Kolbe (R) of Arizona introduced bills which would have stopped production of pennies (in 2001, the Legal Tender Modernization Act, and in 2006, the Currency Overhaul for an Industrious Nation [COIN] Act). In anticipation of the business of melting down US pennies and US nickels for profit, the US Mint, which is a part of the US Department of the Treasury, implemented new regulations on December 14, 2006, which criminalize the melting of pennies and nickels and place limits on export of the coins. Violators can be punished with a fine of up to $10,000 USD and/or imprisoned for a maximum of five years. Lyndall Bass (born July 5, 1952) is an American realist painter and teacher who primarily paints still lifes, flower paintings and symbolist figure paintings. She lives and works in Santa Fe, New Mexico. She is the designer of the 2010 penny known as the Union Shield Penny. Lyndall Bass’ design for the new 2010 Penny has been selected as the winning image in a Federal competition as one of eighteen finalists. Her initials, LB, can be found on the reverse under the left side of the scroll. The intials JFM on the right side belong to Joseph F. Mennna, the staff medalist who sculpted the design. The coin entered circulation in 2010 and will be ongoing each year for at least the next fifty years. The design is emblematic of President Lincoln’s preservation of the United States of America as a single and united country. The penny features a Civil War era shield with vertical stripes symbolizing the thirteen original states joined in a single compact union. The E Pluribus Unum above them is Latin for “Out of Many One”. The scroll across the shield bears a One Cent curved letter design meant by the artist to stand for the re-establishment of trust in the economic flow of currency after the Civil War. Without the resolve of President Lincoln to win the Civil War, establishing peace and cooperation, we would not be the fifty United States we are today.